Gracyn would like nothing more than to return to her old life, one that was boring, but also safe. Instead, she begins to sink deeper into the mystery surrounding the murder of a young girl while defending herself against an evil witch. Gracyn’s attempt to carry on with school as usual is quickly derailed by Marguerite’s threats. When her car slides off the road one morning, she realizes Marguerite isn’t playing around. Not sure where to turn, Gracyn feels lost and alone until Lucian steps in, teaching her how to harness her energy and use magic to defeat Marguerite. If only it was that easy. Putting her faith in Lucian, Gracyn trusts him to help her find her inner strength. But her world is turned upside down when she uncovers new evidence in the murder case, leading her to question his innocence. After refusing to heed the warnings about him, she starts to wonder if she’ll be the next victim and resolves to fight for the truth, no matter what that might be. About halfway home, the memory of my afternoon with Lucian vanished when a gust of wind kicked up the snow. Within seconds, Gypsy and I were engulfed in white-out conditions. I squinted, trying to see through the snowflakes whipping sideways, but it was impossible to make out the trees a few feet away. 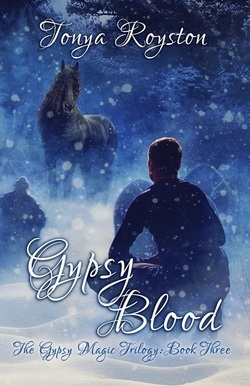 Gypsy planted her feet, halting as the blizzard circled us like a tornado. She whinnied, the fear in her cry sending an icy blast of panic through me. Spinning around, Gypsy pawed at the ground, snorting angrily. She tossed her head, her reddish mane barely visible in the dense cloud of snow swallowing us up. I couldn’t see a thing, let alone tell which direction was which and how to get home. My heart pounding, pure fear taking hold of me, I grabbed Gypsy’s mane, hoping she’d get us out of here safely. Instead of charging through the storm, she raised her head, her ears pointed forward. Without any warning, she began backing up as a wave of solid white rolled toward us. She stood up on her hind feet, her hooves striking at the snow about to topple us. I tried to hold on, but lost my balance and fell to the ground. The snow was soft when I landed, wrapping around my neck and wrists, sending a shiver through me. Catching my breath, I stood up and looked for Gypsy, but saw no sign of her. I spun in a circle, the blizzard closing in on me. My pulse quickened as fear lodged itself in my throat. Feeling trapped, I froze, not sure what to do. I was about to run through the blowing snow when the blurry shape of a person emerged. The figure came closer and, just when I recognized Marguerite’s long red curls, my world went black.